When people first meet CGCC student Jonathan Neptune, they often assume he’s all rough and tough—perhaps living on the wrong side of the tracks. But there’s nothing any farther from the truth. Sure, Neptune has more than a few very visible tattoos. They cover his legs, arms, and part of his chest. But for him, each of these pieces of art is a reminder to himself as well as all who meet him that you can’t judge a book by its cover. But there have undoubtedly been times when “Johnny” hasn’t always been so extroverted and self-confident. He grew up in Washington, living in at least 20 different places before he turned 20 and moving three times alone in third grade. So at an early age, he just stopped trying to make friends. Without a doubt, this and other factors made for a lonely, hard childhood. And that’s how after graduating from high school Johnny lived for several years. He worked a variety of jobs, tried not to get caught up in the wrong crowd, and taught himself various hobbies like computers and cars. For him, going through the motions of life was all there was to life until 2008 when the unexpected happened: Johnny learned he was a father. A series of events brought him to The Dalles in 2010, where he started working a string of jobs that often didn’t pan out because he lacked a college degree. However, these professional experiences enabled him to realize his passion for business, so when an opportunity arose to apply for a scholarship at CGCC, he did just that. Today, he’s perhaps one of the college’s most dedicated, driven students. A CGCC Foundation scholarship recipient, who will graduate Spring 2016 with his Associate of Applied Science in Management plus additional education certificates, Neptune exemplifies someone capitalizing on golden opportunities. He studies hard, takes full advantage of faculty, staff and student support, and has evolved into his own best advocate, someone who truly believes he can achieve his professional dreams, perhaps working for Google or Insitu in the Gorge and even owning his own business some day. 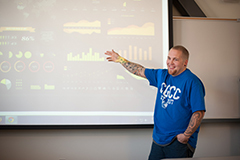 While he attributes much of his personal growth to what he’s learned from CGCC students, faculty and staff, there’s no doubt that he’s also changed because of others he’s met in the community. A couple of years ago, he started helping out at Under the Skin Tattoo and Body Piercing in Hood River. In exchange for occasional “pay” via tips and tattoos, he’s learned a lot about the business, doing all kinds of little odd jobs from answering phones to sanitation and setting up food and toy drives. He’s also lent that business some of his own self-taught talent for technology by helping the owners with their website for example. All this is more than a fair trade, says Johnny, who credits the folks who work there with empowering him to become more outspoken and proud of what he looks like, who he is, and what he believes. Consequently, anyone who meets him will say he’s anything but anti-social or introverted today. He’s become bold—even brazen—in a very good way. Covered in tattoos, Johnny is bucking his family’s conservative past, speaking up for himself, and doing whatever it takes to make a difference in the lives of those who matter most to him—his circle of students and teachers, those who’ve lifted him up in life, and, of course, the son about whom Johnny’s world relentlessly revolves.